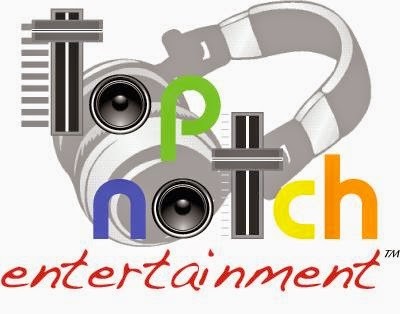 Welcome to the Top Notch DJ Service BLOG!! : Baby Shower Fun!! Raleigh DJ Company, Top Notch DJ Service offers event planning tips, song recommendations and DJ thoughts to assist entertainers, event planners, future brides and grooms, wedding planners and fellow dj's. Yes, you read the above title of today's post correct, it does in fact say “Baby Shower” as the focus for today's Top Notch post. In fact, Top Notch had the opportunity to help plan and work Rachana's Baby Shower this past weekend and it was a blast! We spent weeks prior to the event discussing games, props needed, and music for the baby shower. And it went over very well! Furthermore, Top Notch prepared a multitude of activities and games that the guests seemed to enjoy. NOTE: To my fellow mobile DJ readers, the “DJ” material for today's post stops here. This post has little to do with deejaying, and everything to do with entertainment and event planning, however, for those who may be planning or intending to plan a baby shower anytime in 2016, read further for a number of the many games Top Notch played which the guests fully enjoyed. Q: What candy may describe a baby's umbilical cord? Q: What Candy describes how much free time the mother will have once the baby is born? Q: Before the baby is at the appropriate age to eat solid foods, what may you describe his or her diet? Baby Music Trivia- This game is quite common at Baby Showers and very similar to music trivia. A selection of Pop or famous songs are chosen that have the word “Baby” in the title such as “Hit Me Baby One More Time”, Oooh, Baby I Love Your Way” or even “Baby, Baby” (by Amy Grant or Justin Bieber). Guests must determine the name and artists of the song from the snippet that is played. The first person to answer both artists and song title correctly win. Shoe Game- Top Notch is notorious for playing this game at weddings for brides and grooms. Coincidentally, the same concept and game can be played at baby showers as well. The future Father and Mother are sat in chairs with their backs to each other and are asked a series of questions regarding their expectations, thoughts and hopes for when the baby arrives. The Father and Mother cannot see their mate's answer, but when the answers do not match, between the couple, it make's this game quite entertaining for all spectators involved. 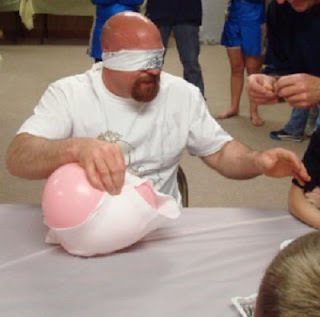 Blinded Diaper- This game did require some preparation as diapers as well as filled balloons ar required for the game to be played. You can actually do one or 2 rounds of this game, one for men and the other for women. In Saturday's case, we provided all of the men with a diaper and a balloon as well as a specific time. The first man who successfully wrapped his balloon with the fitting diaper was the male winner. We then had the females play the same game, however, the females were required to be blindfolded! Of course, we could have began the game by blind folding the guys as well, but we decided that many girls gain experience via babysitting in their youth, mean while guys on the other hand may have no clue how to appropriately put on a diaper. The game was definitely a success! Balloon Belly Comparison- This activity was probably the most simplest game we played, yet the males and girls participated and had a great time. Balloons were blown and placed underneath participants shirts (to resemble a pregnant belly). Then the mother to be had her waist measured. The game participants balloon belly's were measured and compared to the mother to be's actual pregnant belly. The game participant that had the closest waist measurement to the mother to be's stomach won! See Our Most Popular POSTS!! Frightfully Fun Games to Play for your Halloween Party!! Wedding Reception Games your Guests will LOVE!